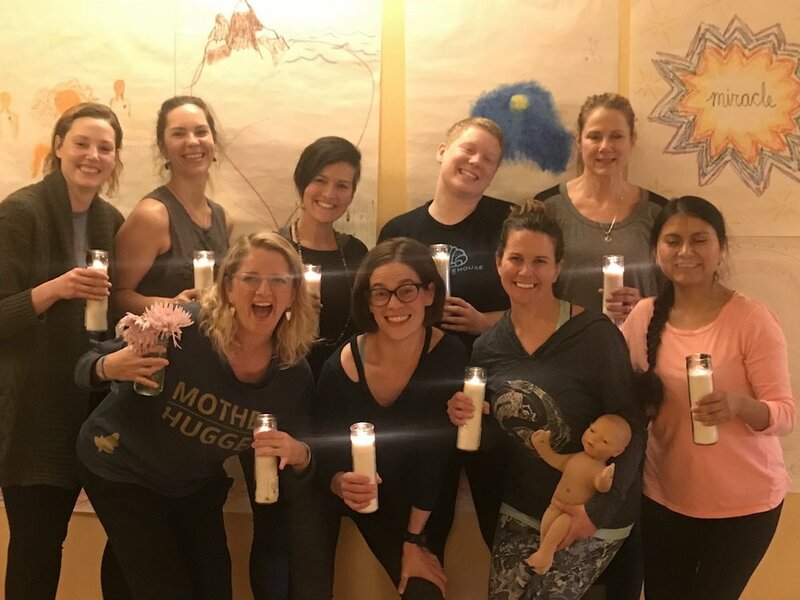 Maggie Mehr - Doula — Blog - Blooma Prenatal Yoga Instructor Training! This past weekend I was lucky enough to attend Blooma’s Level 1 Prenatal Yoga Instructor Training. Blooma is a perinatal wellness center founded by Sarah Longacre and located in Minneapolis. Sarah teaches the training as well. I have a personal yoga practice that I’ve been resurrecting lately, but I never thought about teaching yoga classes. Recently, though, I’ve seen more interest from my clients in incorporating yoga into their lives prenatally and during labor. When a fellow doula told me about this training, I thought “What the hell?” and jumped right in. I don’t know exactly what my expectations were, but the training was not what I expected at all. I’m a very traditional learner and I love structure and concrete activities. This was much more spiritual and it was a completely unique experience. We started Thursday evening off with a group meditation on each of our life stages and then introductions honoring the lineage that brought us here. But what I thought was the most important activity was the discussion about “who’s in your class?” Sarah had us explore the different types of folks that might attend a prenatal yoga class and it got me thinking about inclusivity and sensitivity in my childbirth education classes. Because of the size of my classes I don’t always know where everyone is coming from or how their day has been or how they’re feeling about their pregnancy. But I’m hoping to find a way to connect a little more deeply with each of my families. Friday started with Sarah leading us through the prenatal sequence that’s the core of Blooma classes. We got to practice the poses (for those kinesthetic learners! ), see her teaching style and get ideas for how to structure our own classes. The most dramatic moment for me during this whole weekend was during this practice. One of the 5 poses that are always included in Blooma yoga classes is Goddess Pose. In every prenatal class, everyone, including the instructor, holds this pose for at least 3 to 4 minutes without stepping out or taking a break. The idea is that becoming a parent and going through labor are not things that you can step out of. While you are having a contraction, you can’t tap out. You have to do what you need to do to get through it, however long or short or intense it is. This pose helps folks find their strength in discomfort and move past the pain and frustration knowing that they’re safe. As we held this pose for the first time, I found myself reflecting on this idea through the burning of my thighs and the intensity of the movement. The feeling of endurance and the intensity overwhelmed me and I found myself openly crying. I was overcome by my own strength and the strength of all the birthing people I’ve had the opportunity to work with. After that tearful moment, Sarah’s good friend and my coordinator at Beautiful Birth, Emily Shier, came in to talk about doulas and what they do to help pregnant and laboring families. She showed Emily Rumsey’s documentary, Doulas: A Documentary, which I highly recommend. It was great to see Emily and to share my own experiences a doula with some of my other classmates. Later in the afternoon, Sandy Ager, a local chiropractor, came in to talk to us about the role of chiropractic care during pregnancy and birth. Chiropractic is not something I’m very familiar with, so it was wonderful to hear about the benefits that it could offer the pregnant folks I work with. Megan Stansil started the day by leading us through the Blooma sequence. Unfortunately, I woke up sick on Saturday, so I came in after the practice was done. I got a chance to meet her on her way out, which was great, though! I did get to meet the Wildwood Clinic providers, Drs. Brian Webster and Sasha Ilkevitch. What incredible resources these two are! Dr. Webster, a family medicine provider, explained the difference between midwives, family medicine doctors and obstetricians. He was great about answering some of my clarifying questions about what family med doctors can and cannot do in the Madison area. Dr. Ilkevitch is an integrative physical medicine and rehabilitation physician at Wildwood who helps pregnant folks through osteopathic manipulative treatment. OMT was new to me, so it was fascinating to hear about how this can help with pubic symphysis and SI joint pain that’s so common in pregnancy. Modifying the distance between my feet to make room for a 38 week belly! Kristen Wilson, a fellow doula, led the final yoga sequence of the weekend. It was great to see her style in contrast with Sarah’s. She also shared with us that she and Megan are opening are perinatal wellness center in Sun Prairie called Haumea. Such exciting news! Stay tuned for more information! The final activity of the day was a chance for each of us to practice teaching part of the prenatal yoga sequence. It was great to see everyone’s teaching styles and get a chance to try teaching for myself. We closed the day with a repeat of our opening ritual and photos! Please send me an email or comment below if you have any questions about what I learned!